I presented an abridged French version of this talk at the Université de Moncton, on September 27, 2016. The talk was part of Visible/Invisible, a collaborative project with Daniel H. Dugas, Symposium d’art/nature September 22 – October 2, 2016. How I came to the Symposium d’art/nature and the Parc Écologique du Millénaire, Moncton, or what can an artist do to draw attention to the acceleration of climate change. When Daniel and I began to collaborate in 1990, we had each been working as artists for several years. To identify our collaborative partnership, we adopted the working name: Limit(E) productions which we continued to use for several years. 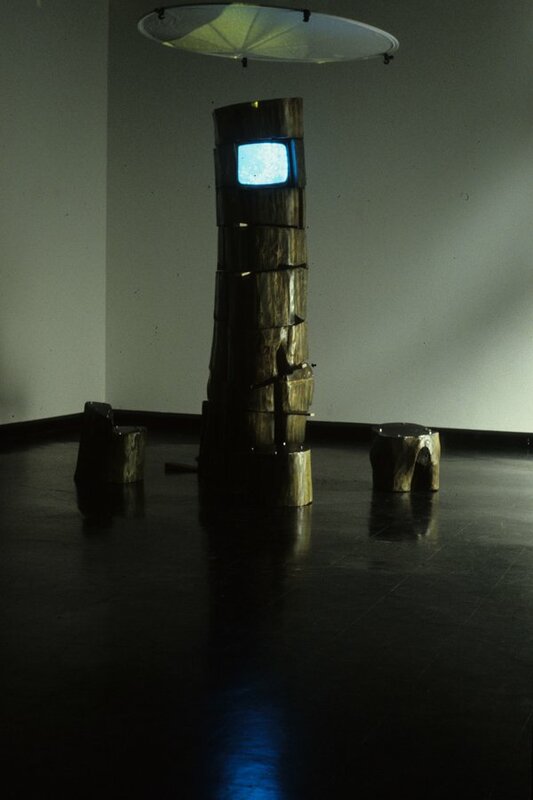 We produced the multifaceted video installation: Transitory, during the time when we were earning our MFA’s at the School of the Art Institute of Chicago, 1991-93. The installation involved a mulberry tree that was reconstructed and preserved. Above the tree, slides of colorized leaves were projected onto a circular reflector. A monitor built into the tree played a program of colorized leaves blowing in the wind. A talking car alarm with the sensor embedded into the tree warned viewers to ‘step back’ if they come too close. We created this work to represent an extreme infringement on nature and to protest the directions that developing technology appeared to be forging upon the human spirit. It seemed that we were entering a time period of tightened restraints on both the natural world and human culture. We simultaneously produced the video series In Transit during the 1991-93 time period. We used a cut and paste method of uniting individual inputs of writing, video, sound and music. In Transit was an in extremis take on the time period and the culture of the early 1990’sin this high-density American city. Along with all of the great things happening in the city, Chicago was experiencing increased levels of violent crime rates. The statistics included 928 persons murdered in 1991 and 943 persons in 1992, before dropping to 856 in 1993, the year we graduated. Our individual and collaborative projects continue to evolve. The concerns often move between public / private, and how technology structures influence and carry messages of change and growth. At the heart of our activities is an interest in the ways that economic, political, and sociocultural factors trickle down to infiltrate all aspects of human society. We work from a holistic point of view and a desire to establish a rapport between what is experienced and what is imagined; ideas that emerge to see the light of day, and those that remain below the surface. Much has been said about mirrors, about visibility and Invisibility, but while looking for points of discussion for this project, I was thinking of the idea that when we look into a mirror, we expect to see ourselves looking back. I was thinking about some of the work of Belgian surrealist artist Artist Réne Magritte when I came across a website with this portrait that I, at first, mistook for a spinoff of his work. I decided that the image looks more like Kevin Bacon as Hollow Man, in a very lame science fiction-horror thriller from the year 2000. And finding the site reminded me of the love / hate relationship I have with MARKETING. Because we live in a time in history, and a place in the world where marketing RULES, we are constantly pitted against of the narrowing of opportunities and diversity. In all fields of interest, we are encouraged to specialize and to competitively advertise that specialty. The downside is that specialization sometimes implies that persons working through life in a variety of ways; changing course and hovering in some of the less travelled pathways, are perceived as not working seriously enough. Hope might lie in the prospect of parallel tracks where all aspects of human concerns might be addressed. Suspension of adherence to the forced pressure of specialized market economies would be required, to achieve a holistic environment. In the early 1970’s, Artist Gordon Matta-Clark believed in stepping back to take a more careful look at where the progress of continued growth was taking us. His work during that time period continues to hold value. Trained as an architect, instead of building, he worked as a performer, photographer, and sculptor. His practice was diverse. He was probably most well known for making cuts in condemned buildings. While these cuts created spacial artworks in their own right, they also drew attention to environmental development in urban centres. For the Biennale de Paris,1975, he created the Conical Intersect, an antimonument. The construction of the then-controversial Centre Georges Pompidou necessitated the destruction of two 17th century historic buildings that had survived the two world wars. 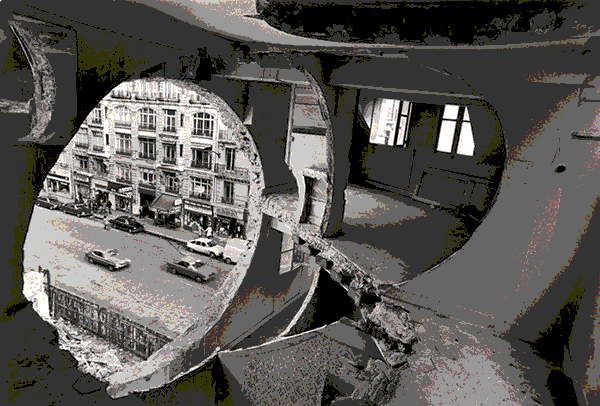 Cutting a large cone-shaped hole, at a forty-five-degree angle through the condemned townhouses, Matta-Clark directed the view from inside the buildings toward the site of the Pompidou. From the street view, it was possible to look back through, up into the skeleton of the townhouses. While Gordon Matta-Clark used the destruction of whole architectures as a basis for his work in critiquing urban gentrification, the Earth Artists of the 1960’s and 70’s worked within landscapes to make monumental impact. Dennis Oppenheim was an American conceptual artist, performance artist, earth artist, sculptor and photographer. While still a student, Gordon Matta-Clark worked with Dennis Oppenheim on his Annual Rings,1968. The project is described as inspired by the annual rings of tree growth. Pathways were shoveled in the snow on either side of the frozen waterway dividing the Unites States and Canada, and their time zones. Drawing attention to national and temporal man-made boundaries through this ephemeral work, Oppenheimer questioned the relative values of ordering systems that we live by. Having died in 1973, Robert Smithson is remembered for his use of photography in relation to sculpture and land art. 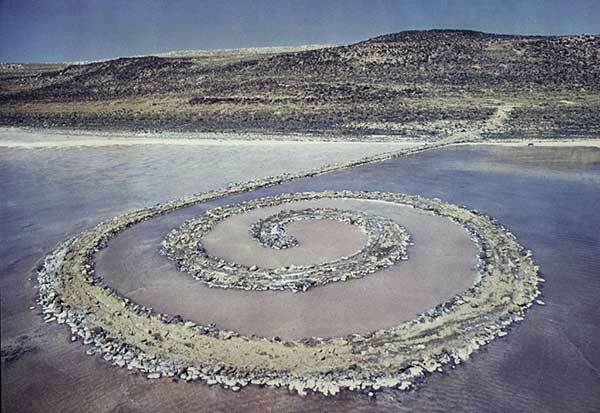 The Spiral Jetty, 1970 and the documentary film based on its construction are considered to be his signature work. Constructed on the Northeastern shore of the Great Salt Lake, Utah, the sculpture is built of mud, salt crystals and basalt rock. Since the initial construction of Spiral Jetty, questions regarding proposed changes in land use in the area surrounding the sculpture and preservation of the sculpture have fueled a debate. 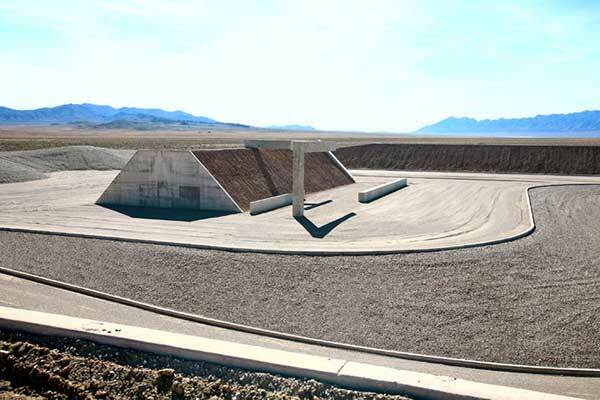 The sculpture is sometimes visible and sometimes submerged, depending upon the water level of the Great Salt Lake. The earth artists monumental sculptures of the 1960’s and 70’s artists continue to bring back the question of what should an artist do? In many cases, what the artists were doing by creating monumental works that were visible from the air, amounted to being not much different than massive land displacement projects carried out through mining and urban development. Within the second wave of earth artists that opened up in the 1980’s, there began to be a more kind appreciation of environment. 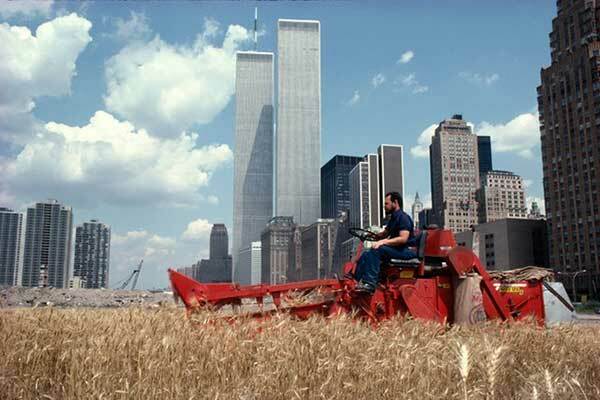 Wheatfield, A Confrontation, 1982 by SOHO based artist Agnes Denes involved the transformation of two acres of land in Lower Manhattan into a wheat field. The field was in the Battery Park landfill and in the shadow of the Twin Towers, with the New York Stock Exchange looming just outside. Denes had said that her idea was to create “an intrusion of the country into the metropolis, in the world’s richest real estate.” During the course of this project, Denes cleaned trash from the site, brought in topsoil, planted, harvested and exhibited a wheat crop. The seeds from the wheat were then spread around the world to be planted. Denes’ project brought attention to many issues and instigated discussions. Controversy lurks even within this earth artist project as the transportation of seeds falls into one of the characteristics of the Anthropocene, that of introducing invasive species. But Denes was early in the wave of artists trying to effect a positive difference through the work of repurposing and restoring damaged land. In 2016, what is there that qualifies as untouched nature? After talking around all of the angles, I return to how I have come to be here at the Symposium d’art/nature. One way to begin approaching contemporary issues of climate change and the need to somehow slow the growth of environmental destruction is to internalize it. When Daniel and I carried out research in the Florida Everglades, for the month of July 2014, it had a mesmerizing effect. We returned to Moncton to build the FLOW: Big Waters project from the research material. As the project continued until March 1, 2016 when we launched the sound walks, we continued to be in the Everglades. In other words, the transformative ‘nature’ of nature continued to surround us. Since that time, our work has been screened at several Miami venues, in Bristol, UK and in Sao Paulo, BR at the FILE 2015. In March 2015, we presented at the AnthropoScene: Art and Nature in a Manufactured Era Conference, Coral Gables, FL through the University of Miami. A curated program of our FLOW: Big Waters videos was included in the Exhibition at the Abess Centre. We also participated in a panel discussion and conducted a Visible / Invisible workshop. 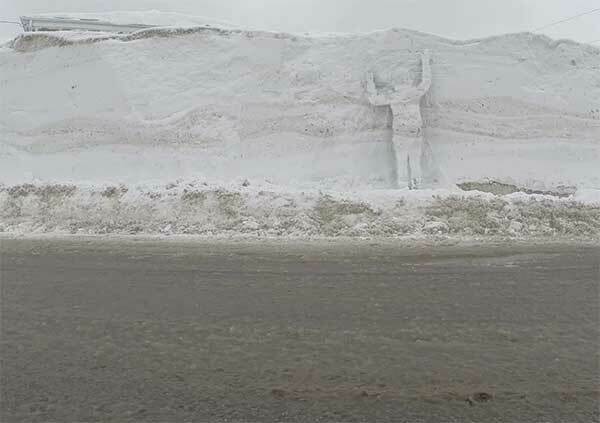 To prepare for the trip, we did a version of the exercise featuring Moncton’s big snow. 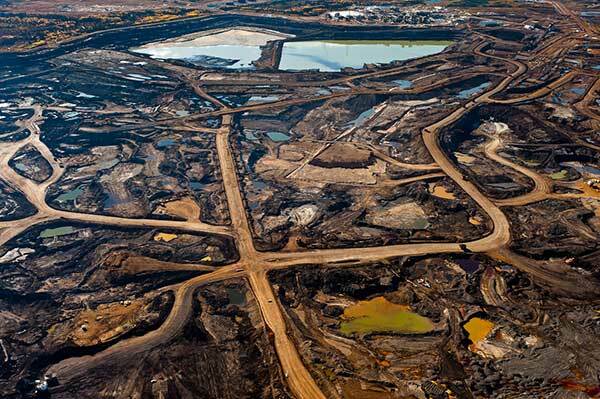 In 2015, the Anthropocene Working Group, at the University of Leicester, UK was tasked with studying the factors and making a decision of whether to declare that human activity has created this new era on earth. Their 2016 announcement has changed from asking whether we have transitioned into an age that humans have built – to declaring how its beginning can be marked. One difficulty in declaring beyond doubt, that the planet has entered a new geological era, is the fact that there is no clear line of strata to unearth and to date as was the reliable procedure in the past. However, it is generally agreed that there is an accelerated rate of change to the planet itself, and that this has been the result of human actions. This time, the conversation begins with experiments in the impossible negotiation of creating almost invisibility from visible passage in a green space. 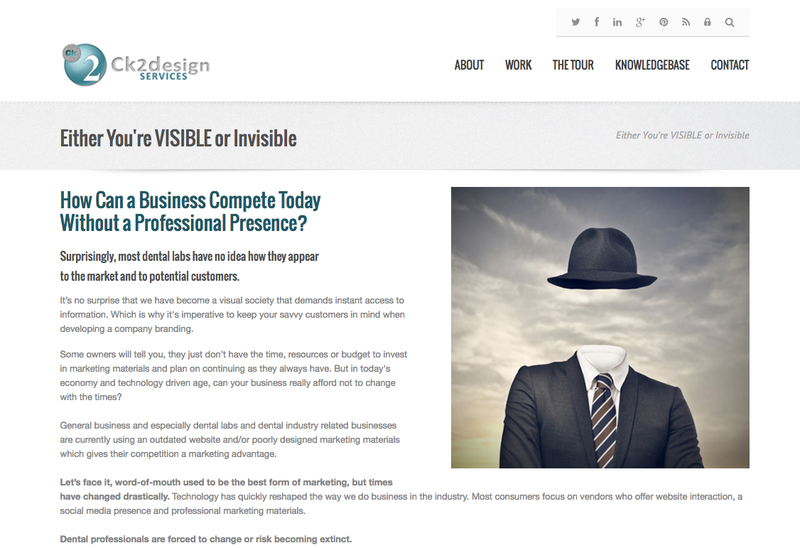 Science tells us that the existence of visibility and invisibility at the same time is not possible. In the world of glass, it is said that we do not create clarity in the process, instead, we mask the opacity of the material. To be seen or not seen seems simple enough, until we start to look more closely at the concept of seeing. Then we start recognize that we can miss part of the picture as our ways of seeing often start with expectations and experience; what we think we will see, or what we would like, or not like to see. In terms of the art world, ways of seeing have been and continue to form opening points of many discussions and studies. Through our project Visible / Invisible, we are working to create invisibility within plain sight, that is to say that no one is going away, everyone continues to exist and to co-exist in multifaceted planes of the software project. 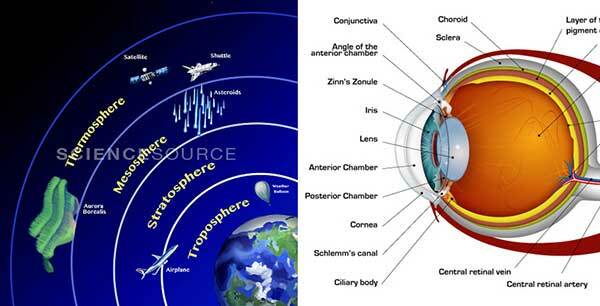 Rather than creating true invisibility, we are masking visibility by superimposing another layer overtop of the spect-actor. One reason for creating this ‘imperfect’ invisibility is that concepts of visibility and invisibility open endless possibilities for discussion. 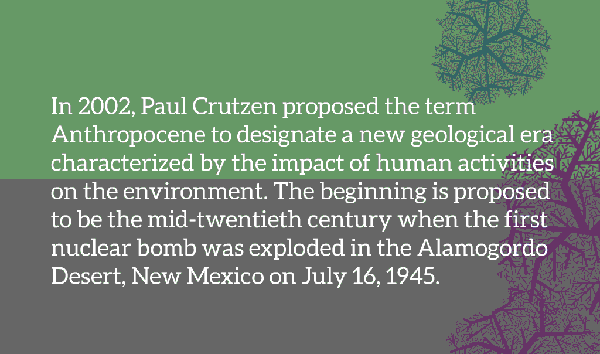 We hope to get out to enjoy the outdoor space and to generate opportunities for discussion and reflection on where we stand in the proposed declaration of the Anthropocene. In chaos theory, the butterfly effect is the sensitive dependence on initial conditions in which a small change in one state of a deterministic nonlinear system can result in large differences in a later state. In another way of seeing it, as our world is not only a mirror but a multifaceted environment, it might be possible to complete the bigger picture, by changing a detail. What can an artist or any one person working in any chosen field do in the middle of landslide changes to environmental baselines? Why this exercise? If the playground is big, it is not infinite. Our project Visible / Invisible presents an existentialist game where the spec-actors can re-define their presence and rapport with the world. Boal, A., (1992). Games for Actors and Non-Actors, Second Edition, (Trans. Adrian Jackson). Routledge, London and New York. Deleuze, G., Guattari, F., (1987) Milles plateaux (A Thousand Plateaus, Capitalism and Schizophrenia). (Trans. Brian Massumi). University of Minneapolis Press, MN. Dugas, D. , LeBlanc, V. (Spring 2016). 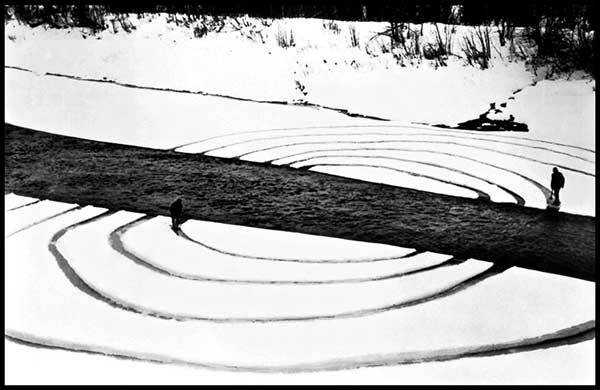 FLOW: Big Waters, Billie, Undercurrents in Atlantic Canadian Visual Art, Volume 1 / ISSUE 2. (Co-Editors: Terry Graff, director/CEO and chief curator), Beaverbrook Art Gallery, Fredericton, NB, pp 6 – 19. Krause, B. (2012). The Great Animal Orchestra, Finding the origins of Music in the World’s Wild Places, Back Bay Books, Little, Brown and Company, Hachette Book Group, New York, NY. Louvel, L. (2011). Poetics of the Iconotext. Université de Poitiers, France. (Ed. Karen Jacobs. Trans. Laurence Petit.) Ashgate Publishing Limited, Farnham, Surrey, UK. Merleau-Ponty, M. (1959). Le visible et l’invisible, [The Visible and the Invisible]. . (Ed. Claude Lefort., Alphonso Lingis, Trans. 1968). Northwestern University Press, Evanston, IL. Morris, E. (2011). Seeing is Believing (Observations on the Mysteries of Photography), Penguin Books, New York, NY.